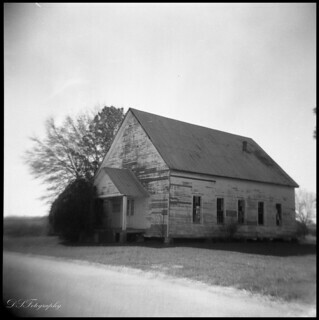 Youngs Chapel as seen through the lens of my Holga. The Holga "sees" and "captures" the heart and soul of places like this better than any other camera out there. Youngs Chapel is wonderful yet heartbreaking place. Once it was center of a small community, the place where people got together to fellowship, sing, and worship.....today, it is a place that is forgotten. Left to die a slow death like so many other churches of this era. When I see the "megachurches" of today, I can't help but remember scenes like this one....and wish there were more places like this. Small communities, small churches, places where people really know each other. They cry together and rejoice together as they go through their lives with each other.